Supernova Exploding Galaxy - Universe Galaxies And Stars Section. Supernova Exploding in Nearby Galaxy NGC 2403. Hubble Space Telescope captures supernova exploding. The Hubble Space Telescope captured this image of a supernova exploding in a relatively nearby galaxy. The star that became supernova SN 2004dj was probably 15 times the mass of our own Sun, but only 14 million years old - the larger the star, the shorter and more violent its life is. 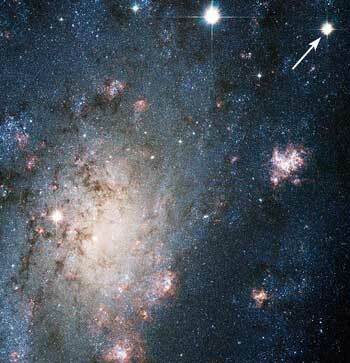 The star was located in a Galaxy called NGC 2403, which is only 11 million light-years from Earth, so this makes it the closest supernova seen in more than a decade. Astronomers will continue to study SN 2004dj for years to understand how certain kinds of stars explode, and what chemicals they're made up of. The explosion of a massive star blazes with the light of 200 million Suns in this NASA Hubble Space Telescope image. The arrow at top right points to the stellar blast, called a supernova. The supernova is so bright in this image that it easily could be mistaken for a foreground star in our Milky Way Galaxy. And yet, this supernova, called SN 2004dj, resides far beyond our galaxy. Its home is in the outskirts of NGC 2403, a Galaxy located 11 million light-years from Earth. Although the supernova is far from Earth, it is the closest stellar explosion discovered in more than a decade. The star that became SN 2004dj may have been about 15 times as massive as the Sun, and only about 14 million years old. (Massive stars live much shorter lives than the Sun; they have more fuel to "burn" through nuclear fusion, but they use it up at a disproportionately faster rate.) A team of Astronomers led by Jesus Maiz of the Space telescope Science Institute discovered that the supernova was part of a compact cluster of stars known as Sandage 96, whose total mass is about 24,000 times the mass of the Sun. Many such clusters - the blue regions - as well as looser associations of massive stars, can be seen in this image. The large number of massive stars in NGC 2403 leads to a high supernova rate. Two other supernovae have been seen in this Galaxy during the past half-century. The heart of NGC 2403 is the glowing region at lower left. Sprinkled across the region are pink areas of star birth. The myriad of faint stars visible in the Hubble image belong to NGC 2403, but the handful of very bright stars in the image belong to our own Milky Way Galaxy and are only a few hundred to a few thousand light-years away. This image was taken on Aug. 17, two weeks after an amateur Astronomer discovered the supernova. Japanese amateur Astronomer Koichi Itagaki discovered the supernova on July 31, 2004, with a small telescope. Additional observations soon showed that it is a "Type II supernova," resulting from the explosion of a massive, hydrogen-rich star at the end of its life. The cataclysm probably occurred when the evolved star's central core, consisting of iron, suddenly collapsed to form an extremely dense object called a Neutron star. The surrounding layers of gas bounced off the neutron star and also gained energy from the flood of ghostly "neutrinos" (tiny, almost non-interacting particles) that may have been released, thereby violently expelling these layers. This explosion is ejecting heavy chemical elements, generated by nuclear reactions inside the star, into the cosmos. Like other Type II supernovae, this exploding star is providing the raw material for future generations of stars and planets. Elements on Earth such as oxygen, calcium, iron, and gold came long ago from exploding stars such as this one. Astronomers will continue to study SN 2004dj over the next few years, as it slowly fades from view, in order to gain a better understanding of how certain types of stars explode and what kinds of chemical elements they eject into space. This color-composite photograph was obtained by combining images through several filters taken with the Wide Field Camera of the Advanced Camera for Surveys. The colors in the image highlight important features in the galaxy. Hot, young stars are blue. Older stars and dense dust lanes near the heart of the Galaxy are red. The hydrogen-rich, star-forming regions are pink. The dense concentration of older stars in the galaxy's central bulge is yellow. In addition to the visible-light image shown here, ultraviolet images and spectra are being obtained with Hubble's Advanced Camera for Surveys. Astronomers are also using ground-based Telescopes to study the supernova.